The KTM 390 Duke comes with a four-stroke liquid cooled, DOHC 375cc single-cylinder petrol engine with dual overhead camshafts delivers a Peak Power of 44BHp @ 9500rpm and a Max.Torque of 3.57kgm/35Nm@ 7250rpm. It comes with a 6-speed manual Transmission gear box with one-down and five-up in a toe-shifted pattern. The gear ratio is well-spaced. Safety features includes four-pot radial-mounted single 300mm rotor disc in front and 230mm disc brake at rear with Bosch 9MB twin channel ABS braking system. The ABS can also be switched off, via a button on the instruments panel and has an adjustable rear brake pedal. 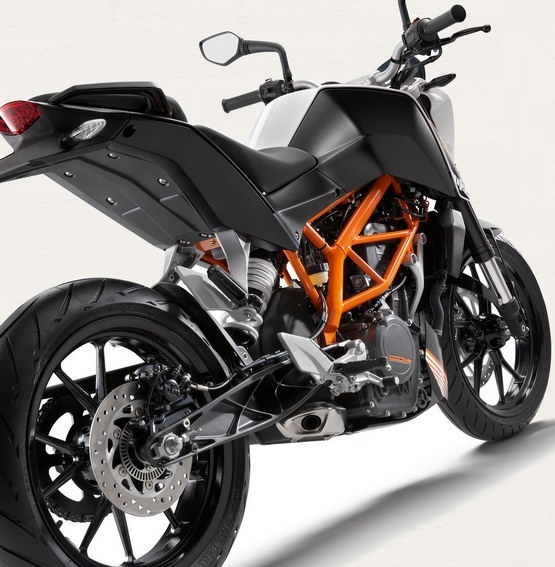 Other striking features of KTM 390 Duke Bike includes tubeless Metzeler radial tyres, orange powder-coated steel trellis frame, Dog-leg shaped control levers, functional rear view mirrors, attractively sculpted tank unit, smart swingarm, split seats, contemporary tail-fairing, slim brake warning light and outstretched number plate mount,X-ring-sealed drive chain. The KTM 390 Duke comes with an exhaust note which is rorty and baritone. It has an overall weight of 139kgs and has a top speed possible of 162kph. The Duke has an 11-litre fuel tank. It has a fuel efficiency of around 22-25km/ltr. Color options includes Orange, White and Black. 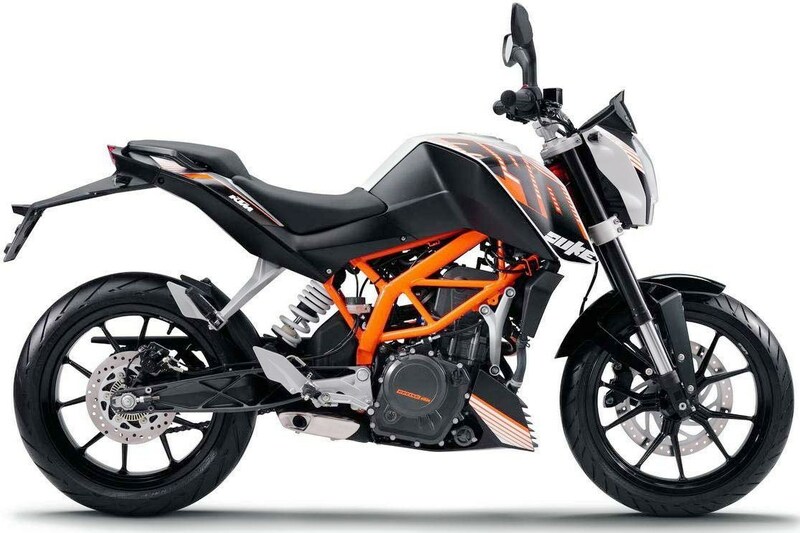 The KTM 390 Duke comes with an expected price of Rs. 1.9 Lakhs. 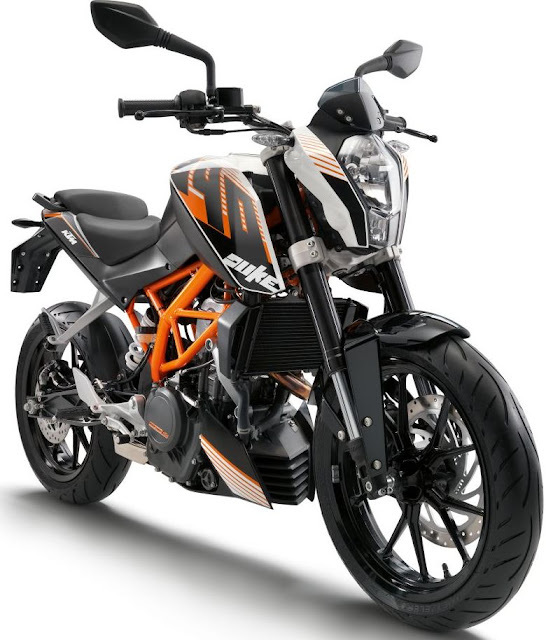 Tags:- KTM 390 Duke details, KTM 390 Duke features, KTM 390 Duke specs, KTM 390 Duke launch, KTM 390 Duke mileage, KTM 390 Duke india price, KTM 390 Duke india details, KTM 390 Duke india varients price, KTM 390 Duke variants,KTM 390 Duke pics, KTM 390 Duke pictures, KTM 390 Duke images, KTM 390 Duke trim levels.